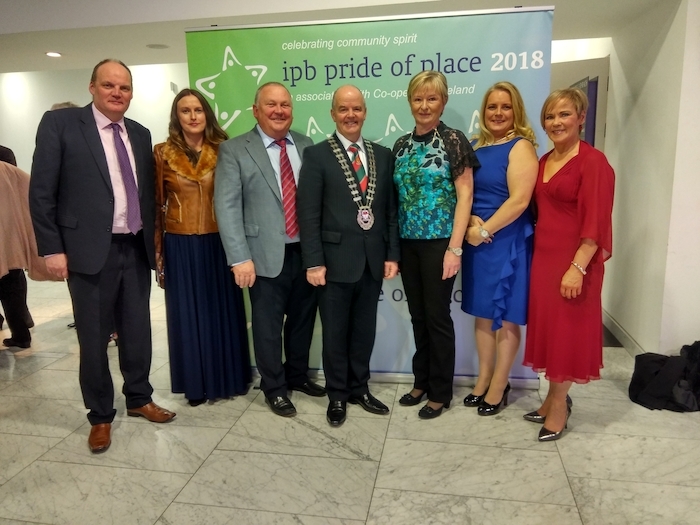 Brilliant Balla win at Pride of Place: At the Pride of Place awards last Saturday night were: Donagh Gilmartin, Síofra Kilcullen (Mayo County Council), Pat Boyle, Blackie Gavin (Cathaoirleach Mayo County Council), Judy Boyle, Mary Gilmartin and Mary Costello (Mayo County Council). Balla has taken a National Pride of Place Award at the prestigious Awards Ceremony held in Cork City Hall on Saturday November 17. Balla won the overall award in the 300-1000 population category. Of the Balla entry the judges said: "It is rarely that the judges visit a place where virtually everybody encountered is on cue regarding sustained co-operative effort and what it takes to maintain a sustainable community. Undoubtedly this is one such place. Everyone can and does feel valued and supported. Erris Irish Wheelchair Association were runners-up in the Community Well-being Targeted Group Category. Mayo was represented by three projects at the awards – Balla, Erris IWA and Céide Coast Community Tourism project. All three were nominated earlier in the year by Mayo County Council. Representatives from all three projects were among the 800 strong crowd in City Hall. Pride of Place is an annual all-island competition organised by co-operation Ireland, IPB Insurance and Local Authority partners which acknowledges the work of communities all over the island of Ireland. Judging took place in August and consisted of a site visit to each location with presentations by community representatives of their achievements and tours of the areas. Spokesperson and Head of Community Engagement for Mayo County Council, Ms Síofra Kilcullen, stated: "We are extremely proud of our three entries who work tirelessly to make their communities better places to live, work and visit. That work goes on every day, and are delighted to get a chance to acknowledge it through the Pride of Place Competition"